Brookstone Anti-Snore Pillow as the name suggest claims to reduce the users snoring while the sleeper remains in their normal sleeping position. 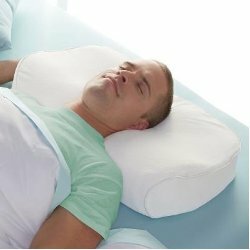 The Brookstone Anti-Snore Pillow has a built-in support system cradles your head and neck, to help keep your chin out and your airway more open. With your help we can reach more people and let them know about Brookstone Anti-Snore Pillow whether this product works or not.